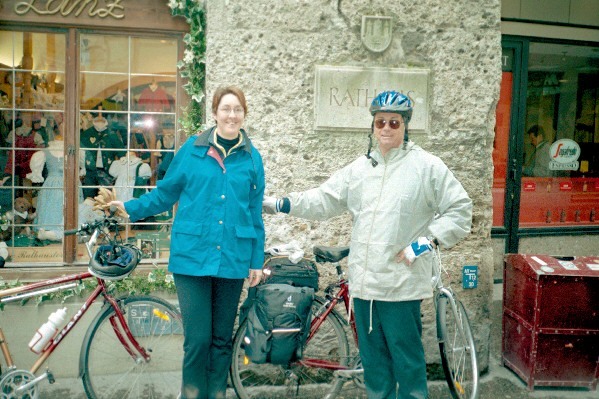 In April 2001, as first time cycle tourists we set out for our Austrian Odyssey with a sense of excitement at a new adventure. We had decided after a few weeks of research on the internet, that the Danube seemed a fine place to start. We read that it offered wonderful scenery, good food, friendly people and relatively flat, well signed bike paths from Vienna to Passau, and we were not disappointed. 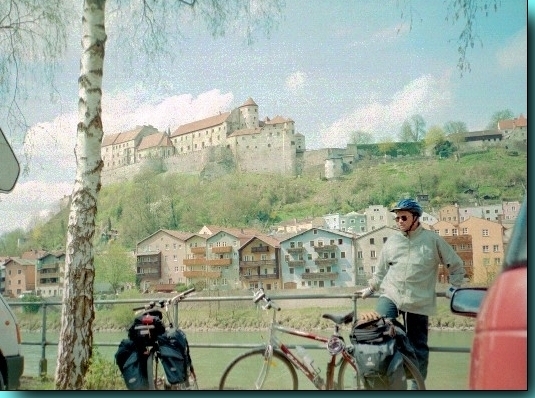 Our plan was to ride Vienna to Passau, then onto Salzburg along the Inn and the Salzach Rivers. 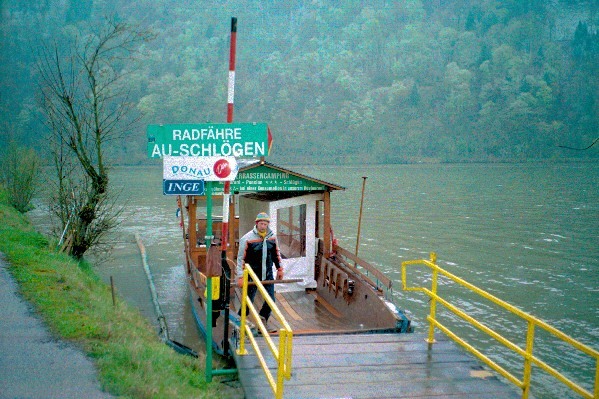 The Danube Bike Trail , or the Donau Radweg as it is known in Austria, is one of Europe's most popular cycle routes - attempted by tourists of all ages. The trail offers beautiful historic cities, stunning abbeys, picturesque villages, remote valleys and fertile farmlands, vineyards and apricot orchards. The route from Vienna to Passau (just over the German border) is some 326 km long. What we did not realize before we left is why all the web sites and books we came across all seemed to go in the direction Passau to Vienna. The answer, we were told just before we set off from Vienna, was the "wind", which predominantly runs down the Danube valley from Passau to Vienna, and that the gradient is very slightly downhill from Passau to Vienna. Nonetheless, being the mad Aussies that we are, we decided we would not let this information phase us , and off we set - up the Danube, against the wind on 3. 4. 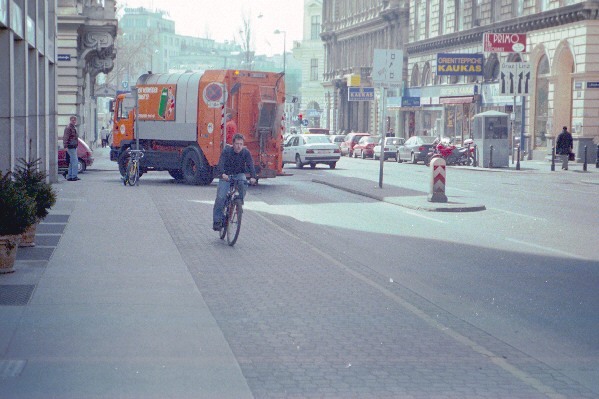 2001 from Vienna. A word of warning re stop-overs - Airport " Left luggage" can be quite expensive so if you plan to take your bikes to your hotel to store and have arranged transfers, make sure you notify the company that you are carrying bicycles. We travelled as lightly as we could with just 2 rear panniers and a rack pannier. We did take a number of spare tubes but were lucky enough not to need them. We also took all the tools necessary to reassemble our bikes. We took a couple of general travel guides on Austria and bought maps we needed when we arrived in Vienna. We can highly recommend the Bikeline series of maps (Note that their Website is currently only in German). We did manage to get an English version of the Donau Radweg (Book 2 which covers Vienna to Passau) from Pedalpower in Vienna. We were unable to get English versions of the Tauern Radweg (Passau to Salzburg) or Salzkammergut Radweg book but the maps in them were still invaluable. At 50 and 36 years of age respectively, my husband and I were not really as fit as we once were. However, we still play tennis once a week, ride 10 to 15 km most weekends and walk 1.5 hrs every second day on average. Unfortunately, time did not allow us to do a lot of training before we left but had we done some longer distances beforehand it may have ironed out a couple of glitches - like sore butts and the need for a good cushioned seat cover and the somewhat sore knees I had for the first couple of days. But we decided to start with shorter distances and work up. We found accommodation easy to find in most places although we were touring before the main tourist season started on May 1. 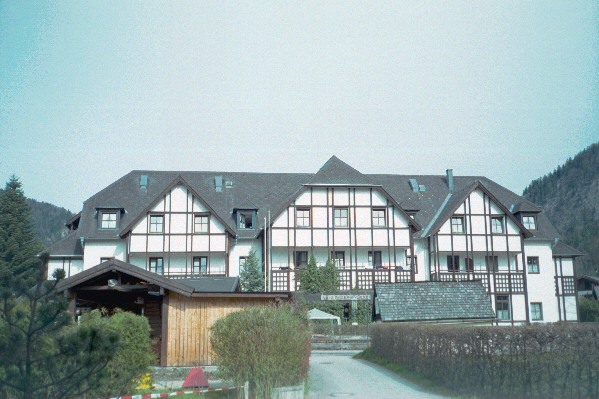 We relied mostly on small pensions or "zimmer frei" but also stayed in some hotels and some Jugendgasthauses (youth hostels - which all had comfortable double rooms with their own shower and toilet), and all provided breakfast. We also found that most of the towns along the trail had bike shops if you needed to pick up any parts or accessories or if you needed repairs. A handy little booklet on the Donau Radweg is available from the tourist office in Vienna .This lists all the towns where it is possible to have repairs done, accommodation and campgrounds etc., however it is only available in German. Day One saw us arrive in Vienna at 6:15 am faced with the dilemma of lugging all our luggage and 2 bike boxes to our Pension in the centre of the city. I'm still not sure how we managed it but we got ourselves our luggage and our bike boxes on the underground train into the city. However, the closest train was still a bit of a walk from our accommodation. So after the Herculean task of getting ourselves up the escalator to the street, we managed to find a smallish station wagon taxi who agreed to take us to our accommodation with the bike boxes hanging out the back of the taxi - albeit for an exorbitant fee!! Fortunately, we discovered a much easier option for the reverse trip on our way home (see later). Our bikes are finally ready after a do-it-yourself crash course in bike assembly! 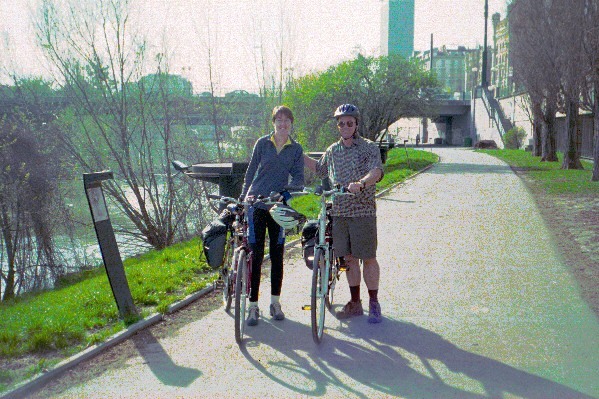 Off we cycle along the city bike paths of Vienna to reach the Danube. Believe it or not in Vienna the cars stop for cyclists and cyclists have their own traffic lights on the path ! BIKES RULE !! I love it! Our destination today is Tulln -38km away - which we think should be a relatively easy ride. How wrong we are!! The path is quite open and unprotected from (you guessed it) THE WIND. We battle a particularly ferocious headwind all day. Adding to this difficulty is the fact that for some strange reason my husband finds he is only able to pedal with his heels as his panniers are getting in the way. It takes us quite a number of kilometres to realize the reason for this is the little pockets on one side of each pannier i.e. they are designed to be a definite left and right! This rectified we continued on and fell into the first guesthouse we find - right on the track - as we arrive in Tulln. (Guesthouse Beim Salzturm - which was very comfortable and friendly). It is here in Tulln that we start to notice all the magnificent spring bulbs that are starting to bloom - tulips in every colour of the rainbow and beautiful daffodils. Well it's 46 km to Krems, our destination today. Thankfully today is not as windy! The path varies from river edge through fields, small villages and wooded areas - and we have it almost all to ourselves all day. We see pheasants, ducks, and hares dashing across the track. There are pretty finches in the trees and we come to the first of the apricot orchards - with their trees now covered in pink blossoms! 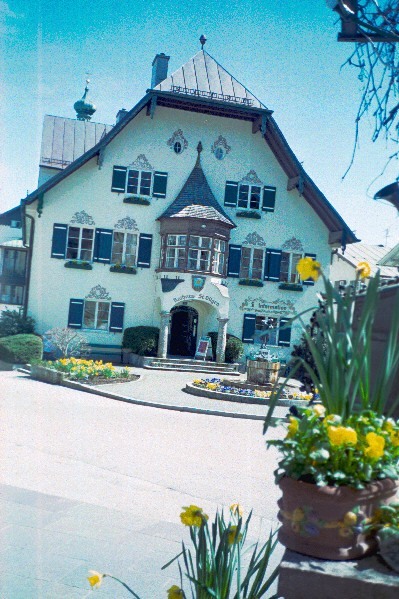 We stop at Gasthaus on der Donau near Traismauer where we enjoy a well earned gourmet lunch of smoked trout. It's about now that I wish I'd done more training for the trip. My quads and backside feel like they don't belong to me! 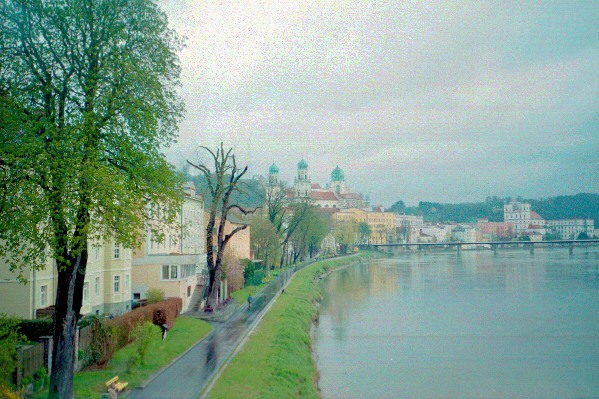 We push on and make it to Krems though, which is a beautiful old town. Mike finds us a room in the oldest guesthouse in town - the recently renovated Hotel Altes Post. It is like taking a step back in time , having quite a medieval feel. 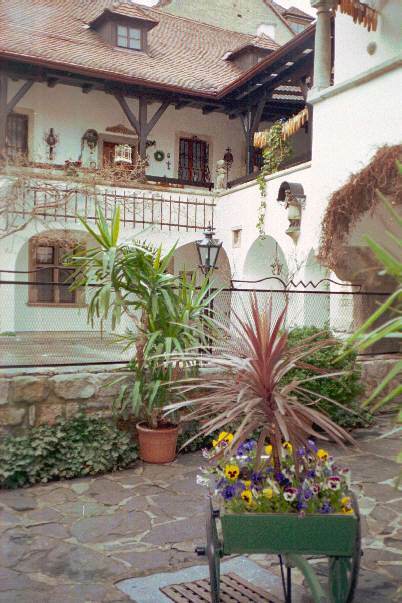 There are beautiful rooms and a large courtyard with dried corn cobs hanging from the balconies. Well it is Sunday today so we fittingly decide to have a day of rest. To keep with the theme we visit the Benedictine monastery at Gottweig. Unfortunately it is teeming with rain and the train only goes to within about 4 km of the mountain on which the abbey is situated, so we try our luck hitching a lift! Within no time at all a friendly local has taken pity on us trudging in the rain and takes us up the mountain. Visitors to the monastery are allowed to wander round the abbey complex and there is a great restaurant overlooking the Danube valley. I'm sure the views would be splendid on a clear day. We tried the best beer of the entire trip here - a "dunkel" or dark beer called - Gemisches Bier Von Fass. It is so good Mike considers starting a beer importing business - or perhaps this is only due to the fact that we drank such gigantic glasses of the stuff! We walk the couple of kms back down the mountain to the main road and in minutes another friendly local has stopped for us. As luck would have it she was on her way to work in her wine shop in Krems which was just a few metres from our hotel! 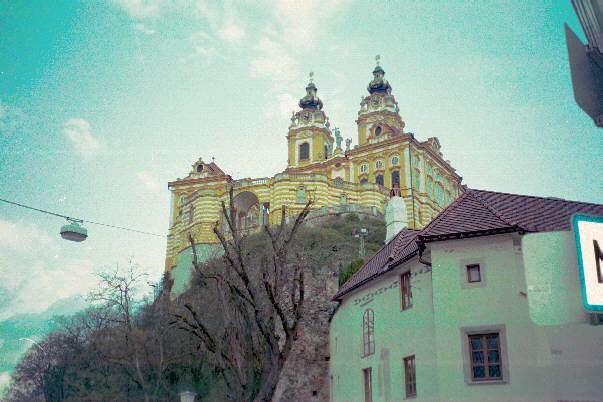 Our destination today was Melk - 42 km away. We continue along the northern bank of the Danube past Stein the smaller, older sister town to Krems. Morningtea is spent at Durnstein, which is a beautiful little village with cobbled streets and a ruined castle from the 12th century in which Richard the Lionheart was held prisoner in 1192-1193. A little further on is Weissenkirchen another quaint Austrian village in the heart of the Wachau wine-growing area. Vineyards and apricot orchards line the path along the northern bank for most of the day. We stop for lunch in Spitz and sit on the sunny verandah of the restaurant marvelling at the beautiful Danube in front of us whilst we feast on a 3- course meal of great Austrian food and wine for only A$16 each! With great difficulty we hop back on our trusty steads and pedal on, crossing back over the river to the southern bank just prior to Melk. 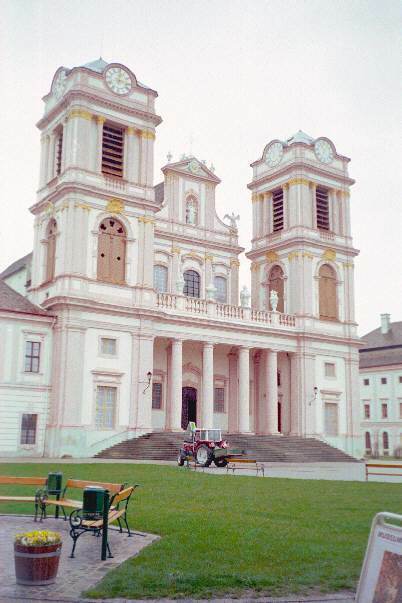 The stunning Benedictine Abbey of Melk dominates the town. We plan to make it to Grein today which is 52km away. We have a late fruhstuck (breakfast) and set off in extreme cold and thick fog. This morning is so cold that we discover the need for full fingered bicycle gloves something which we have never had a need for in warm sunny Brisbane! Luckily I threw in an old pair of leather gloves just as we were leaving. My husband however has to put his thickest pair of socks to new use! Thankfully the fog eventually clears to one of the few beautiful sunny days of the trip! The radweg today takes us mostly along quiet back roads with little traffic. Today is one of the few days of the trip we meet any other cyclists - albeit all going in the other direction! We've seen a number of swans today swimming gracefully by, so we do not feel particularly threatened when we stop for a picnic and 2 swans come waddling over. We soon realised that these are not the placid creatures one presumes as they start to hiss and look very savage indeed as Mike offers them some bread! We beat a very hasty retreat and feel thankful we have bikes. Grein is a lovely old town with a cobbled main street lined with 16th and 17th century houses. One of which is the fantastic 'Pension Martha' which has huge well decorated rooms, cable TV and hairdryers! Grein also has a very good bike shop with friendly helpful staff who speak great English, so the next morning when I discover a nick in my tyre, it's our first stop. I buy a new Kevlar tyre and invest in a gel seat cover which my backside's been thanking me for ever since! So after a very late start we head off in very cold, drizzly windy weather and follow the path along the northern bank of the Danube. The headwind makes it very hard going for the first couple of hours, then thankfully the path leaves the river and we cycle through farms along quiet back-roads to arrive in Mauthausen. The weather is starting to look more ominous so we decide to stay here the night. 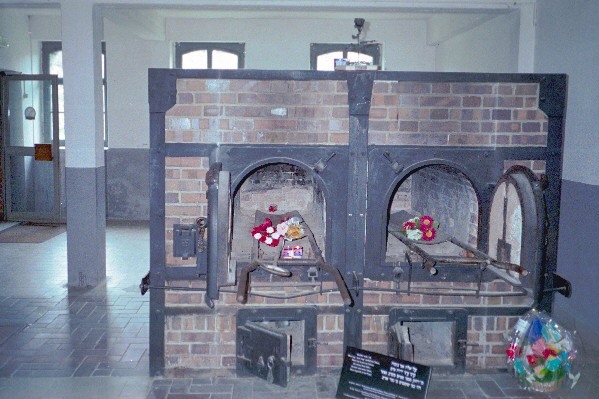 Mauthausen has the ignominious responsibility of being the site of the concentration camp of the same name. One can hardly imagine that in a setting as beautiful as the Danube valley such a thing could exist, but in World War II 105,000 people lost their lives. Most of these people were Russian and Polish POW's, but others were homosexuals, political prisoners, Jews, Gypsies, communists along with Italians, Americans, Hungarian and Dutch. The inmates at Mauthausen were forced to work to exhaustion in the stone quarry. 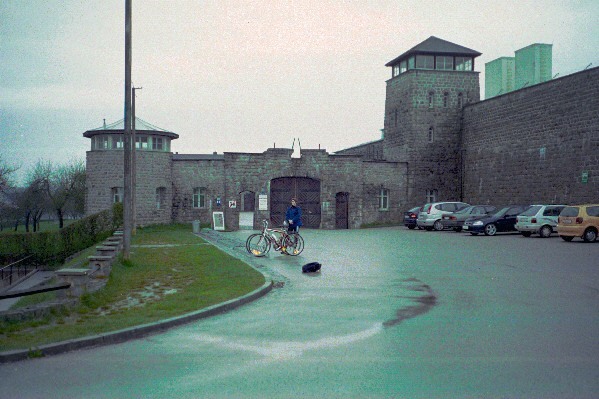 The concentration camp is open to the public so despite the overcast weather we decide to pedal up the steep hill and as we reach the top the weather fittingly seems colder, darker and more drizzly. You almost feel that to have bright sunlight up here would be wrong. The concentration camp is extremely depressing but really had to be seen - as one person had written in the visitors book "If we do not remember history then we are destined to live through it again". It's very chilling and almost impossible to comprehend how such a thing could happen. We have to race back down the hill to collect our things from the hotel which isn't hard because the ride downhill is a bit of a hair-raising descent . I would advise anyone considering doing the same to check their brakes are working well beforehand. We set off along the northern side of the river through farmland and then along the river levee through quite heavy rain and extreme cold. I have packed a big Orange rain-poncho that I did not think I would ever wear but it actually gets an airing in public today and I can tell everyone on the path is admiring it!!! I actually look like a big orange blimp! We finally arrive like two bedraggled rats in Linz only to discover that the only 2 reasonably priced hotels in town are closed for repair. So we push our bikes up the steep hill to the only open youth hostel which actually has comfortable double rooms with own shower and toilet. Well we had only done 38km today but in the teaming rain that was more than enough! As it is Good Friday today we decide to have a rest day in Linz which has a lovely old town centre even though it is a big industrial city. We walk just a couple of hundred metres down the road from the hostel to the Botanic Gardens which has the most glorious assortment of tulips and daffodils all of which were beginning to flower at this time of year. It even inspired Mike, a consummate non-gardener to consider doing some gardening! 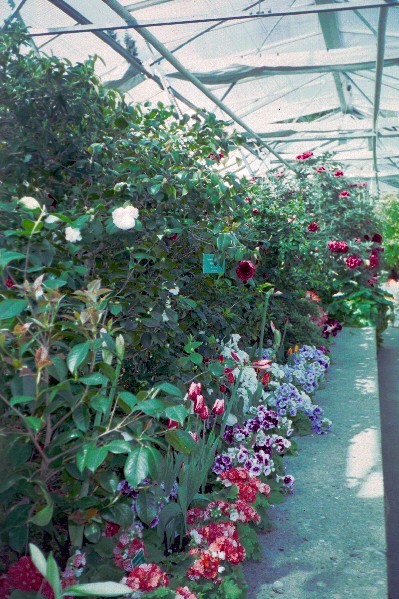 Wonderful greenhouses here were full of orchids, cacti, rhododendrons and clivea which were all in full bloom! Today we see our first snow of the trip which continues lightly throughout the day. The freezing temperatures force us to dart from one warm coffee shop to another - well someone has to sample the apfelstrudel! We look everywhere for full fingered waterproof gloves to no avail. Mike thinks he may have to resort to socks AND plastic bags on his hands if it rains again in these temperatures! We did manage to get some long waterproof overpants which we now realise are essential if one is cycle touring in cool to cold weather. We leave early today as we are planning a 58km ride to Schlogen. We set out at 7:30am from Linz on a frightfully cold day. The Hauptplatz (main town square ) is converted to a flea market this morning - Mike continues his endless search for gloves - and, not surprisingly on a day like today, no one is giving theirs up for sale! It starts to snow lightly as we make our way along the northern bank of the river and then inland through farmland on quiet back roads to one of the friendliest little villages in Austria called Feldkirchen where we stop for morning tea. As I wait outside the corner store with our bikes each local who walks past stops to chat and even though I speak little German we make ourselves understood . They are aghast at the fact that we are cycling in such freezing conditions! We cross back over the river at Aschach also a very picturesque little village. After this the snow starts to get heavier and at times is almost horizontal as we ride into it! We meet a few other hardy souls going in the other direction. We finally make it to Schlogen at around 2:30pm and have a wonderful meal at the 4 star Schlogen Hotel overlooking the river. The temperature guage outside the Hotel reads 5 degrees Celsius as we arrive so I figure with wind chill factor it's been about minus 5 on the path so it's no wonder we feel a bit like icicles. Actually, there's not much more to Schlogen than the Hotel and campground. Lucky for us the campground also runs a B&B and we get the last room which to our surprise was really an apartment. Today we catch one of the famous cross river bicycle ferries. Hans, the ferryman, we discover, is also an avid traveller who works for 6 months of the year in summer and travels for the winter. We discover he's actually seen more of Australia than we have! We have woken this morning to find a light cover of snow on the world and it is still falling quite heavily. We set of through the snow along a lovely wide path along the river - a little protected by trees today. It is Easter Sunday today and we don't expect to find much open in such a devout country but believe it or not we find a village with an open cafe doing a roaring trade so we fill up on hot coffee and Black Forrest cake! We can hear the church bells ringing as we ride past Engelhartszell on the other side of the river. It really is an unbelievable setting looking over the quick-flowing Danube at the church spires on the other side of the river with light snow falling all around us and hearing the church bells ringing. It warms the heart no matter how cold the body is! We realise we are crossing the border only because there is a Bundesrepublica Deutchland sign. The rock of Jochenstein rises out of the water at this point. The legend is that it is the home of the water-nymph Isa, who is Lorelei's sister. The tranquility is shattered and we nearly come to grief off our bikes as a farmer we are just riding past starts shooting at rabbits in his fields. The snow gives way to sleet as we continue riding along the German border on the northern bank of the Danube. 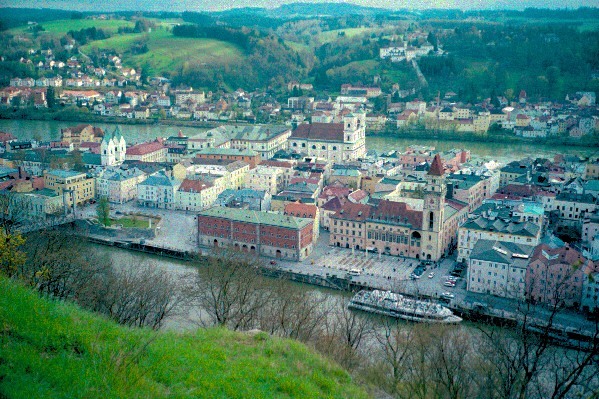 Thankfully, it is not long before we see the beautiful city of Passau looming on the horizon . It is set on the confluence of 3 rivers - the Danube the Inn and the Ilz and indeed is one of the most picture-perfect towns I have ever seen. It has only been a 43km ride today but we are incredibly glad to stop and find a nice warm hotel. We decide to have a rest day to explore Passau. I am a little disappointed because the organ concerts in St. Stephen's cathedral (which I have read so much about) do not start till May the 1st. This cathedral organ is reputed to be the largest organ in the world. We instead wander down to find the start of the Intalradweg which we plan to ride to Salzburg. We cross the bridge and wander around the old Innstadt ramparts and back into the old part of Passau around the promontory then through the old cobbled streets. We find a cafe in the centre of the old town that has a real old world atmosphere and I swear makes the best hot chocolate in the world. The fact that it is attached to a fantastic chocolate shop probably has something to do with it! After lunch we decided to take an hour's cruise along the Danube and Inn Rivers around the promontory of Passau which we can thoroughly recommend. Then we cross over the Danube and take a walk up the hill to the castle and the castle-museum which gave us a very informative look at the history of Passau and indeed of the role of the Danube in early salt trading. In fact the paths we had been cycling along on the banks of the river had once been tracks along which horses pulled the salt-trading boats back up the Danube against the strong current. We dub the smallest room in the castle "the toilet with the best view in the world" as the views over the old city of Passau are stupendous! I would definitely recommend making the effort to visit the castle. Well we're glad we've worked our way up to today as we have 68km ahead of us over hilly terrain through mud and gravel. The trail is not as picturesque as the Danube trail but the fact that the riding is more challenging more than makes up for it as we slip slide through the mud. We both enjoyed it so much it got us keen to try mountain-biking when we go home! We stop for cafe breaks in both Suben and Obenburg (which is a cute little village ). Eventually we arrive in Braunau tired and muddy from head to foot. I suspect no one is going to allow us near their pension if they see us coming but we make our way to the lovely old town centre and make our way to Hotel Gann where the lady proprietor ushers us (and our muddy bikes believe it or not), into her restaurant/breakfast room and proceeds to wash down our bikes and panniers for us! 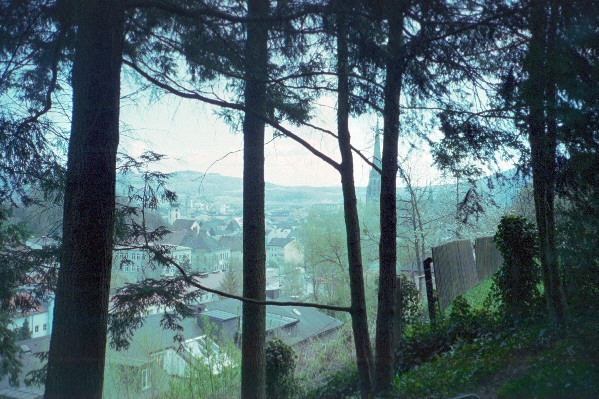 We found this part of Austria from Passau to Braunau to be the friendliest in all of Austria. 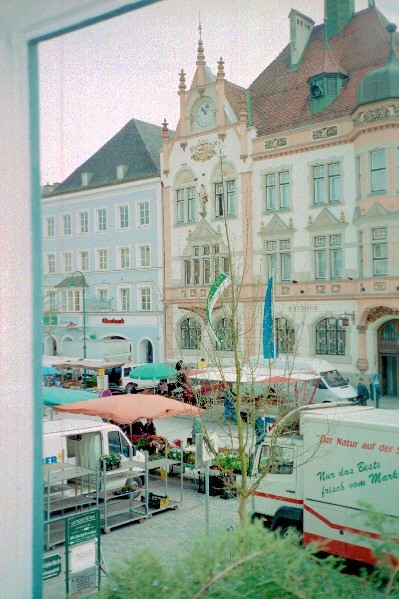 We are awoken very early this morning by noises outside our hotel to discover a huge farmer's market being set up right outside our window in the Braunau Stadtplatz. We take the time to have a good look around and by fresh supplies of gourmet foods for our trip. 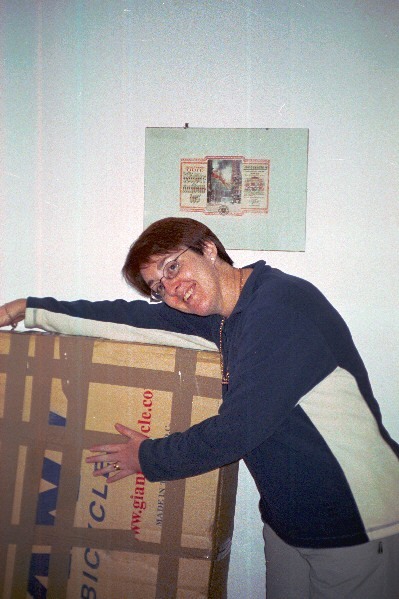 We had been planning to try and make it to Salzburg the following day however Mike's niggling back injury is playing up after all the hills and the lady who runs Hotel Gann recommends we try a shorter trip to Burghausen which is on our way and just over the German border. This was not to disappoint and we can thoroughly recommend breaking the trip there. We only have 25km to ride and it is a lovely sunny day and a few good downhills to enjoy. We find ourselves a pension at Wanghausen on the Austrian side of the river across from Burghausen and unload our bikes so that we can enjoy an unfettered ride over to Burghausen. It is a beautiful old town with cobbled streets and interesting little shops, and one of the longest castles in Europe which stretches along the ridge above the thousand year old town and behind which is a tranquil lake. It is quite easy to explore all of this lovely town by bicycle. We are quite keen to get pedalling this morning as we have spent a freezing night in a hotel room where the heating hasn't worked properly! We plan to make it to Salzburg today which is 55km away. The path is extremely steep as we leave Burghausen and it is a major effort to get our cold limbs working so quickly! We get into a rhythm and continue to climb along the road through the Oberer Weilhartforst (forest) for about 6 km and then down a steep descent back to the river Salzach. We arrive in Salzburg in the early afternoon to find that accommodation in the old town centre is fairly expensive so we ride another 6 or 7 km out of town along Moosestrasse where we find Pension Steinerhof which has been recommended to us by friends. This is probably the most homely pension of our entire trip - so good that it is difficult to leave three days later! The bus leaves right outside our pension to take us into the town centre. We spend the day wandering around the old centre of Salzburg exploring the little cafes and quaint shops full of Easter eggs and Christmas decorations etc. Eventually we escape from the rain and snow by visiting the Naturhaus Museum which is a huge natural history museum. If you are travelling with children this museum would be thoroughly recommended as there are a lot of hands on displays here. The weather is a little clearer today and we are able to look out our window and see the deer in the fields and the snow on the mountain tops. 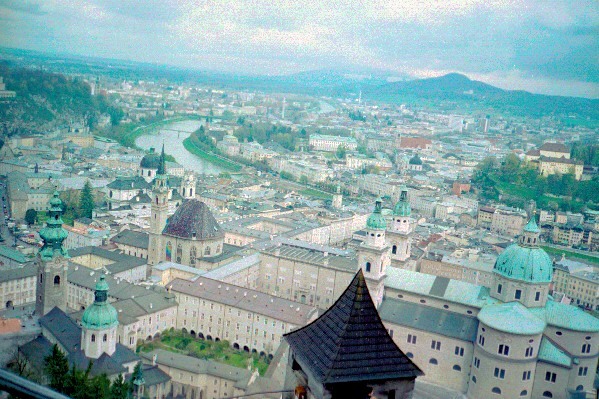 We head back into town and climb up to the fortress or Hohensalzburg which dates from the 1100s and added to extensively in the 15th and 16th centuries. We spend the rest of the day exploring all the little shops that line the attractive cobblestone streets, sampling Mozart balls and Mozart liqueur as we go and looking for souvenirs to take home. We set off from Salzburg this morning after a late breakfast and pedal back into town and cross the river to find the start of the Salzkammergut Radweg. Unfortunately the sign posting on this radweg isn't to the standard of the Danube Radweg and you need to keep your wits about you. After riding a few km we begin to see signs welcoming us into Salzburg and the penny drops that we must have ridden around in a circle! We ask directions and get back on the path pedalling uphill almost to the snow line through a number of small villages. Only to find ourselves again hopelessly lost in the middle of nowhere at a crossroad with no signpost to tell us which direction. We ask directions from a little old lady at a nearby farmhouse and eventually find a road to take us to Thalgau (probably a much busier route than we were supposed to take but beggars can't be choosers!). The altitude drops about 80 m over about 13.5km and we hardly have to pedal at all. We feel like we fly all the way to the edge of Lake Mondsee. The signposting is much better here and at Sharfling we begin a steep ascent of 270m over 3km then coast downhill again into St Gilgen where the road takes you almost straight in the front door of the Tudor style youth hostel! We splurge on a beautiful meal at Hotel Post ( we can thoroughly recommend the food here) before collapsing into bed ! Theoretically today was a ride of 51km but I have a sneaking suspicion we covered a bit more ground than this! We plan a rest day in St. Gilgen today. It is a beautiful sunny day today so we take a hike around the lake past Furberg. We have a superb view back across the lake to St. Gilgen with the snow capped mountains in the background. We walk back around the lake past St. Gilgen and on another 5 km to Abensee and then back. This walk seems to take forever as we are so used to covering this small distance on a bike that we forget how long it takes to do it on foot. We awake to another perfect day - not a cloud in the sky. 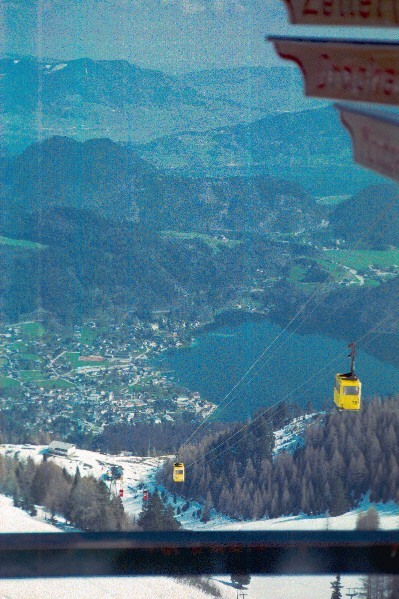 After a deal of deliberation we pluck up the courage to take the cable car up to the summit of Zwolferhorn ( the 1522m high mountain which towers over St. Gilgen ). It is a bit of a nervous ride but the views are breathtaking. From the summit one can see all the surrounding alps and the lakes nestled in between them. 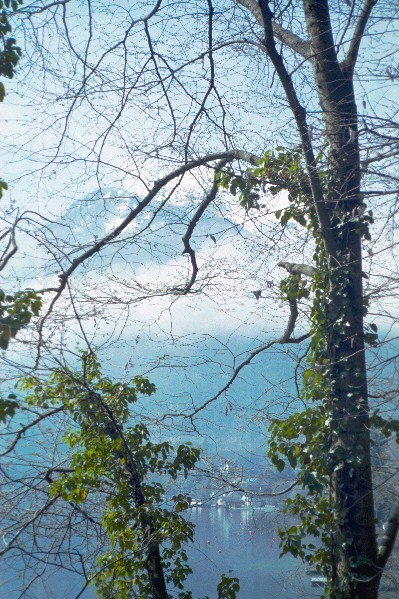 Most of the mountain is covered in snow as are the surrounding alps. Two intrepid locals are being pulled up the slopes on the skis by their dogs ( which look like they would be right at home pulling sleds! ). We take the panoramic walk around the summit and ridge through the snow which is at times about two feet deep at the sides of the trail. We have lunch at the outdoor cafe on the summit overlooking Wolfgangsee as we drink in the scenery. Even though the cable car trip costs over A$30 it is definitely worth it. If you are going here and the weather is fine -DO NOT MISS IT! We bid St.Gilgen "auf wiedersehen" today and cycle off around the lake to St. Wolfgang. We decide to take a short-cut around the end of the lake on a hiking trail rather than on the main road. We decide as the signs specify no cycling that we will walk our bikes over this part. We soon discover why the signs say no cycling as the path becomes narrower and steeper - which we think is tricky on the way up but is even trickier on the way down as we negotiate some very steep hair-pin bends. It takes all our effort and a little luck to prevent us and /or our heavily laden bikes falling over the edge of the cliff and into the lake! ( Needless to say the following day as we leave St. Wolfgang we take the main road!!!). We arrive in St. Wolfgang to find it is a fairly heavily touristed town ( mainly bus-trippers). Despite this most of the accommodation in town is not open until May 1st - however we discover some very friendly, hospitable people willing to open their doors a couple of days early at Pension Seeschwable which overlooks the lake. We set off for the short ride mainly over designated path to Bad Ischl today. The ride is mainly flat with a steep descent into the town itself. Bad Ischl is a quite attractive town built on the banks of the river Traun. Unfortunately it is still not May 1st - the magical day when every pension opens its doors to travellers! We knock on numerous doors all around town before we finally find a room! We decide to sample the elegance of Cafe Zauner in town which is one of the classiest cafe/cake shops I've seen. The following day we relax in the thermal baths at Kaiser Therme for which Bad Ischl is so famed. This seemed to be a fitting end to a wonderful first cycle tour! It is from Bad Ischl that we catch the train back (with our bikes) to Salzburg and onto Vienna.